The cooler cools the wine - without ice - immediately to drinking temperature! The Elegant Cooler contains a reusable Active Cooler cooling element which can be cooled after 5 minutes and then cool for a few more hours. With the Elegant Cooler you do not have any trouble with ice water or wet labels which are detached from the bottle. The stylish Elegant Cooler allows you to chill your wine instantly &ndash; without ice! The Active Wine Cooler Elegant holds a re-usable cooling element that can chill a bottle after 5 minutes and keep it cool for hours. With the Elegant Cooler there is no ice no water no mess and no wet label to fall off. The Rapid Ice Wine Cooler was one of Vacu Vin's earliest innovations and has contributed significantly to the worldwide establishment of the brand since its initial inception in 1986. It was originally manufactured in silver and has subsequently been produced in numerous different colours and patterns. The Rapid Ice was developed in order to enable users to chill their wine promptly and keep it cold for an extended period of time - all without the need for an accompanying refrigerator or ice bucket. The cooling sleeve contains 6 pockets of specifically formulated non-toxic gel that expand when placed in a freezer for a period of 6 hours or more. Upon removal the Rapid Ice is simply inserted onto the outside of the wine bottle and then chills the contents within 5 minutes. Once cooled the wine will remain chilled for hours. Multiple polyester foil layers and foam pouches within the sleeve ensure that the temperature is retained. Chilling drinks quickly and keeping them cold is no longer a problem using the Active Coolers! The amazing Active Coolers can best be described as super cold flexible ice jackets. They can when taken from the freezer simply be slipped over the bottle. The drink will be chilled within minutes and stays cool for hours. 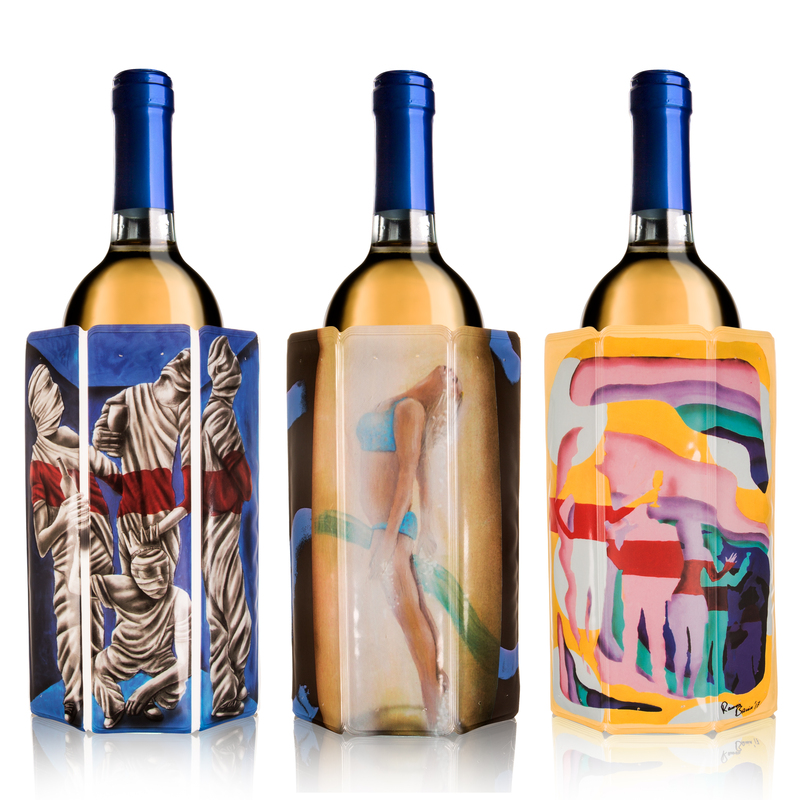 The coolers are unbreakable and reusable.The beauty of art combined with the functionality of a product. The Ramon Bruin Collection by Vacu Vin brings these two elements together. Three Active Wine Coolers are decorated with the art of the famous Optical Illusionist Ramon Bruin. He is able to make the most simple drawing come to life or create complex 3D artwork in which people have to look twice to understand the surrealistic image. The reason for this collaboration is the 25th anniversary of the Active Coolers! Vacu Vin is proud to collaborate with such an impressive artist and to introduce the Active Cooler Wine Ramon Bruin Collection.Ramon Bruin born 1981 in Alkmaar the Netherlands is known for his three dimensional artworks. In 2012 Ramon gained worldwide recognition for his own unique style called Optical Illusionism . Since this breakthrough his artwork has been showcased in over 70 countries. This style revolves around the creation of a photo composition by combining hand drawn pictures with photography. This in turn enables his art to come to life. He is able to make the most simple drawings come to life and create complex 3D pieces in which people have to look twice to understand the surrealistic image. .Chilling drinks quickly and keeping them cold is no longer a problem using the Active Coolers! The amazing Active Coolers can best be described as super cold flexible ice jackets. They can, when taken from the freezer, simply be slipped over the bottle. The drink will be chilled within minutes and stays cool for hours. The coolers are unbreakable and reusable.The beauty of art combined with the functionality of a product. The Ramon Bruin Collection by Vacu Vin brings these two elements together. Three Active Wine Coolers are decorated with the art of the famous Optical Illusionist Ramon Bruin. He is able to make the most simple drawing come to life or create complex 3D artwork in which people have to look twice to understand the surrealistic image. The reason for this collaboration is the 25th anniversary of the Active Coolers! Vacu Vin is proud to collaborate with such an impressive artist and to introduce the Active Cooler Wine Ramon Bruin Collection.Ramon Bruin, born 1981 in Alkmaar, the Netherlands, is known for his three dimensional artworks. In 2012 Ramon gained worldwide recognition for his own unique style called Optical Illusionism . Since this breakthrough, his artwork has been showcased in over 70 countries. This style revolves around the creation of a photo composition by combining hand drawn pictures with photography. This in turn enables his art to come to life. He is able to make the most simple drawings come to life and create complex 3D pieces in which people have to look twice to understand the surrealistic image. .Features. Chills drinks in minutes. Keeps drinks cool for hours. Keep in the freezer. Specifications. Color: . Multi. Material:. Plastic. Dimension:. 5.8 x 1.3 x 7 inches. Weight:. 3. Fast cooling of drinks and for a long time Active Cooler is no longer a problem! The amazing Active Cooler is best described as a flexible extremely cold ice mantle. Take it out of the freezer and pull it over the bottle you want to cool. The beverage is cooled after 5 minutes and then remains cool for a few hours. The radiator is unbreakable and reusable. Inside 6 compartments filled with cryogenic gel. This gel has the distinctive feature of absorbing the cold very important and to retransmit it just as important but progressive after a stay in the freezer. Remove the freezer this sleeve slips around the bottle and will allow you to refresh your drink by about ten degrees in 5 minutes. Then put the cooler in your freezer it will always ready to serve you fresh. Ultra-fast chiller. Sleeve consisting of an insulating outer double wall. Inside 6 compartments filled with cryogenic gel. This gel has the peculiarity of absorbing the cold very importantly and of retransmitting it just as important but progressive after a stay in the freezer. Out of the freezer this sleeve slips around the bottle and will allow you to refresh your drink by about ten degrees in 5 minutes. Then replace the RAPID ICE in your freezer it will always be ready to serve you fresh. Keep your wines chilled to perfection as you serve them with this easy to use Vacuvin Black Active Wine Cooler. This flexible ice jacket slips easily over your wine bottle to chill it in just 5 minutes! It can be stored in the freezer so its always ready to use is unbreakable and reusable. Great for picnics barbecues or last minute dinner guests this wine cooler is a must-have for every oenophile. Fits most standard wine bottles. Vacu Vin Rapid Ice Wine Coolers were developed to chill wine quickly and keep it chilled for an extended period of time all without the need of a refrigerator or ice bucket. The cooling sleeve contains 6 pockets of specifically formulated non-toxic gel that expands when placed in a freezer for a period of 6 hours or more. Upon removal from the freezer the Rapid Ice Wine Cooler easily slides over the outside of the wine bottle to chill the whole bottle within 5 minutes. Once cooled the wine will remain chilled for hours due to the multiple layers of insulated foil and foam within the sleeve. The Rapid Ice Wine Cooler is designed to fit any standard-sized wine bottle. The award-winning wine cooler is both flexible and virtually unbreakable. It is also lightweight which allows you to use it at parties picnics barbecues and much more! Once used simply return the Rapid Ice Wine Cooler to the freezer to reuse over and over again! The lightweight fold flat design allows for easy storage and allows you take it to parties picnics barbeques and so much more! Want to chill your whiskey without diluting it? The Active Cooler Whiskey from Vacu Vin cools your whiskey to the ideal serving temperature without losing any of its complex flavors. Compared to whiskey stones the Active Cooler Whiskey keeps your whiskey at the right temperature longer. The flexible silicone design is inspired by the elegant looks of a rocks glass which accommodates most size whiskey glasses and also prevents it from getting warm when holding it in your hand. The reusable Whiskey Cooler takes up little space in your freezer and is a great gadget for every whiskey enthusiast. We take pride in offering a wide range of Outdoor products and Gifts. Our product miscellany comprises of Coloring book Napkin Welcome sign Bird Feeder and much more. We bring nature and magic to complete your festive season. We are here to inspire beautiful decors for every occasion and thoughtful gift for everyone on your wish list. Spread the holiday spirit in you with Gold Crest. Fast cooling of drinks and for a long time Rapid Ice is no longer a problem! The amazing Rapid Ice Cooler is best described as a flexible extremely cold ice mantle. Take it out of the freezer and pull it over the bottle you want to cool. The beverage is cooled after 5 minutes and then remains cool for a few hours. The radiator is unbreakable and reusable. Vacu Vin Rapid Ice Wine Coolers were developed to chill wine quickly and keep it chilled for an extended period of time, all without the need of a refrigerator or ice bucket. The cooling sleeve contains 6 pockets of specifically formulated, non-toxic gel that expands when placed in a freezer for a period of 6 hours or more. Upon removal from the freezer, the Rapid Ice Wine Cooler easily slides over the outside of the wine bottle to chill the whole bottle within 5 minutes. Once cooled, the wine will remain chilled for hours due to the multiple layers of insulated foil and foam within the sleeve. The Rapid Ice Wine Cooler is designed to fit any standard-sized wine bottle. The award-winning wine cooler is both flexible and virtually unbreakable. It is also lightweight which allows you to use it at parties, picnics, barbecues and much more! Once used, simply return the Rapid Ice Wine Cooler to the freezer to reuse over and over again! Vacu Vin was established in 1986 in Delft, the Netherlands. For over 30 years this family-owned company has evolved into the leading brand within the housewares industry, offering an array of barware accessories and kitchen gadgets that are characterized by their quality and innovative functionality. Vacu Vinâ€™s product portfolio also includes award-winning Wine Coolers, Pineapple Slicers and other gadgets now used in over 35 million households and more than 80 countries throughout the world. A specialist, European in-house design team are constantly striving to add new items to the companyâ€™s ever-evolving product portfolio to satisfy the demands of the savvy, modern-day consumer.